BlackBerry maker Research in Motion is considering splitting its business in two, separating its struggling handset manufacturing division from its messaging network, The Sunday Times reported. RIM, which last month hired JP Morgan and RBC Capital to look at its strategic options, could break off its handset division into a separate listed company or sell it, the British newspaper said without citing sources. Potential buyers would include Amazon and Facebook, it reported, adding that RIM's messaging network could also be sold, or opened up to rivals such as Apple and Google to generate income. An alternative option would be to keep the company together but sell a stake to a larger technology firm such as Microsoft, the newspaper said. 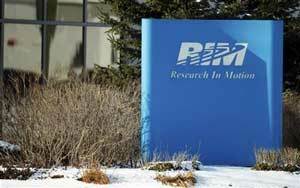 RIM said in a statement that it continued to believe the best way to drive shareholder value was to execute its turnaround plan. RIM virtually invented the concept of on-your-hip email with its first BlackBerry devices, but now finds itself struggling badly in the smartphone market. Last year, it held numerous takeover discussions with potential buyers ranging from Amazon and Microsoft Corp to private equity firms, sources have previously told Reuters. But those talks never resulted in an M&A transaction under former co-chief executives Mike Lazaridis and Jim Balsillie.